The root of the word “miracle” means “wonderful”. And when something fills us with wonder, we often call it a miracle. When we dwell in the Sacred, then we perceive everything as “wonderful” and then we are in the realm of miracles. With these cards, I’d like to show you that from a strawberry to children playing, to a bright star in the sky and a tiny mustard seed everything is Sacred, because you are. 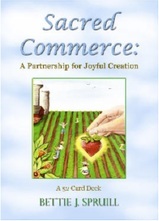 The origins of commerce can be traced to the very start of communication. Communication is the art of exchange and its purpose is to reveal clearly or manifest harmony. Let you reveal to yourself with the aid of these sacred symbols, your own sacredness and the power and peace of your heart and mind. May you share that power and peace as you serve the greater awakening of all hearts by your own awakening. These cards were inspired by my travels around the world, and my own understanding of the Divine Sacred. I’ve been asked how to use these cards. My mother, who loves the cards, reads one in the morning and one in the evening, and then we discuss them. Some people keep them on their desk as a way to guide their day, and some people while looking for direction, will select a card and see what the message is for them. I hope you enjoy having them in your life as much as I enjoyed designing them with Holly Mae Howard, the illustrator and artist, and Anil Singhal of Sungum Publishing.